The Scotts Miracle-Gro Company has created genetically modified Roundup Ready Kentucky Bluegrass as well as genetically modified Roundup Ready Fescue grass and is conducting field trials at the homes of Scotts' employees. Due to a regulatory loophole, there is no US government regulation of GMO grass. These Roundup Ready GMO grasses will increase the usage of the herbicide Roundup in residential, recreational & commercial business settings. There is increasing scientific evidence of the health harms caused by Roundup. Independent peer reviewed studies have found that it is inflammatory, genotoxic, neurotoxic, carcinogenic, an endocrine disruptor and is linked to male infertility. In addition, in 2010, Monsanto patented glyphosate, the active ingredient in Roundup, as an antibiotic. Roundup is also a known chelator that binds to and draws out important nutrients. Scotts' claim that Roundup is benign is false. GMO Roundup Ready grass will result in a further increase in the use of Roundup, which will contaminate our groundwater and drinking water. Imagine your children & pets frolicking around in a sea of herbicidal poison. Because of inevitable contamination, the grass is likely to be eaten by grass grazing animals. There has been no toxicity testing and the potential harm to animals eating this GMO grass is unknown. Will we be saying good-bye to pasture raised meat? Lastly, it is a scientific fact that weeds will evolve to develop resistance to Roundup, leading to ever increasing amounts being applied. 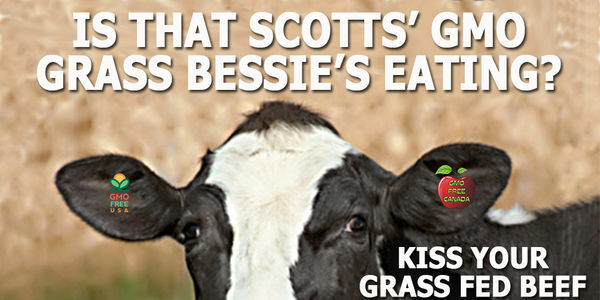 Scotts is Monsanto's exclusive agent for the marketing and distribution of consumer Roundup. The only true benefit of GMO grass is to increase Scotts' sales of Roundup, padding Scotts' & Monsanto's bottom lines at the expense of your health and the environment. We are calling for the BOYCOTT of all Scotts Miracle-Gro products until Scotts eradicates GMO Roundup Ready grass and for Home Depot and Lowes to pledge not to sell it. STOP THE DEVELOPMENT AND COMMERCIALIZATION OF GMO GRASS. PLEDGE NOT TO SELL GMO GRASS. Science and history show us that there is no benefit to GMO grass except to increase your profits and the profits of Monsanto, via an increase in your sales of Roundup. We will boycott all Scotts Miracle-Gro products until you commit to eradicating your GMO grass. TO HOME DEPOT & LOWES: Pledge not to sell Roundup Ready GMO Grass.